Before his recent suicide, Top Gun director, Tony Scott was looking to direct the upcoming Gears of War movie. Tony Scott, the director of Man On Fire and True Romance who jumped to his death from an LA bridge last week, was keen on directing the upcoming Gears of War movie adaptation, according to a series of tweets from former New Line Cinema producer, Jeff Katz. "When we acquired Gears of War at New Line, [Tony Scott] badly wanted to direct. Chased it hard," Katz wrote. "It didn't work out, but I always loved the idea of seeing him play in that sort of Ridley-adjacent space, which he'd really avoided. I'll always wish it happened." 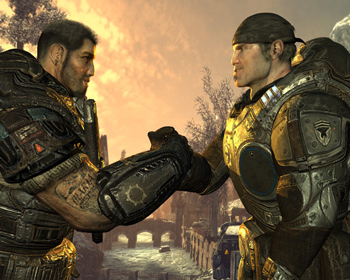 While the Gears franchise will likely prove difficult to adapt to film, Scott's experience on films like Top Gun and The Last Boy Scout would have given him a solid shot at capturing the series' oft-mocked focus on "bromance." While Tony Scott rarely received the same critical acclaim as his elder brother, Ridley, he had a reputation for crafting superb popcorn flicks. Epic Games design director, Cliff Bleszinski, responded to Katz's tweets, noting that he recalls a meeting in which Scott showed a great deal of enthusiasm for the license. "I remember the meeting," he said. "He had a video presentation and everything. He told stories about filming Man on Fire in Mexico." The Gears of War movie is currently trapped in development limbo, though Epic Games President Mike Capps claims otherwise. New Line Cinema acquired the movie rights to the franchise back in 2007, and Live Free or Die Hard director, Len Wiseman, joined the crew back in 2008. It was later revealed that Wiseman dropped out of the project sometime during 2010. Thus far, no replacement director has been announced.